The purpose of this trip, beside the obvious point of getting away from work, was twofold; history and beer. Carol loves history, especially British history. The UK has so much more history than the US. You can visit buildings still in use today that were built before Columbus discovered America. 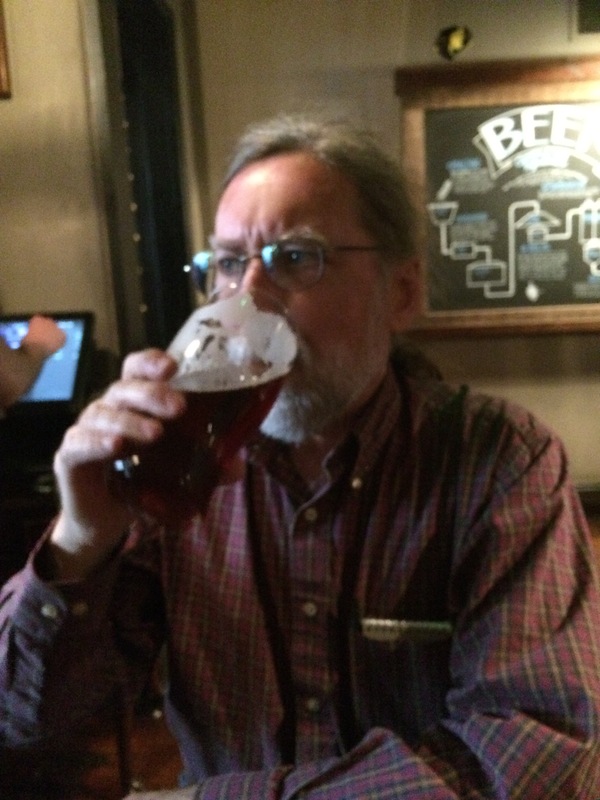 Mike loves beer, especially cask ales (AKA real ales), which we rarely find in the US. And one of the reasons that Mike loves Carol is that she appreciates a good beer as much as he does. Food is also a common interest and although the UK may not (yet) have the foodie reputation of France or Spain, you can find some pretty darn good food there. Don’t believe the old belief that British food is bland. Just check out the list of Michelin-starred restaurants in the UK. And there’s nothing wrong with pub food. We had some darn good fish & chips, savory pies, roast beef, sausages & mash, etc. Although, we must say, they overdo the potatoes. Chips (French fries) come with everything, including dishes that already include mashed potatoes! Tired of British food? Virtually every village has an Indian and/or Chinese restaurant. In London, you can find the food of almost any country or ethnicity that you can imagine. England is a beer lover’s dream. CAMRA (Campaign for Real Ale) is a British organization that promotes real ale. They define real ale as “a natural product brewed using traditional ingredients and left to mature in the cask (container) from which it is served in the pub through a process called secondary fermentation. It is this process which makes real ale unique amongst beers and develops the wonderful tastes and aromas which processed beers can never provide”. No carbon dioxide or nitrogen is added so real ale is not as fizzy as regular beers and is it served at “basement temperature” (50-57 F). Most but not all pubs will have at least one or two handpumps for cask ale. One pub in York had twenty! Bitter ales from the cask (Bishop and Bear in London). If you are a beer lover and are planning a trip to England, download the Caskfinder and CAMRA Good Beer Guide app for your phone. Get the 1 year subscription ($6.99) for the Good Beer Guide as it enables you to locate pubs near you. 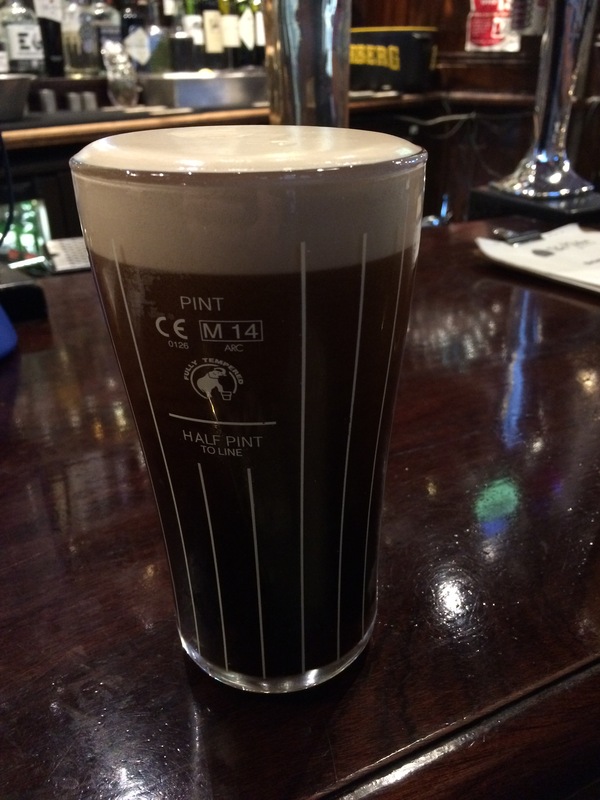 If you don’t like real ale, non-real ale draft beers popular in England and Ireland include Guinness, Carling, Peroni, Fosters, Stella Artois, Heineken, Kronenbourg 1664, Staropramen and Carlsburg. Add Smithwicks in Ireland. Those of you of a certain age might remember the Carling commercials (“Hey Mabel, Black Label!”). Though not widely available in the US anymore, it’s the most popular beer in the UK. Most pubs have an extensive inventory of bottled beers as well, including American microbrews. Note that a British pint is 20 ounces versus our US pint of 16 ounces. The Caskfinder app was created by Cask Marque, another beer-centric organization that certifies that pubs are storing and serving real ale properly and at the proper temperature. Their 45 assessors make over 20,000 visits to 9,000 pubs every year. I wonder how many job applications they get for assessors every day. If you see their logo on the pub door, you know that you’ll be getting a quality pint. There are a couple of British beer styles that Americans may not be familiar with. Mild is malty, low-alcohol, lightly-hopped ale that comes in light and dark-hued versions. There are a few strong milds also, with a higher alcohol content. Only slightly hoppier is bitter, a pale ale. Bitter comes in a variety of strengths and hues. It is not bitter in flavor. The name bitter was given to distinguish it from the less hoppy mild. Ordinary bitter has a strength of up to 4.1% ABV. Best bitter is the term for a higher alcohol bitter (4.2 – 4.7%) and premium or strong bitter (known in the US as ESB Extra Strong Bitter) is 4.8% and up. Bitter is the most popular type of real ale in England. Hopheads will find plenty of IPAs in England. After all, they invented it. 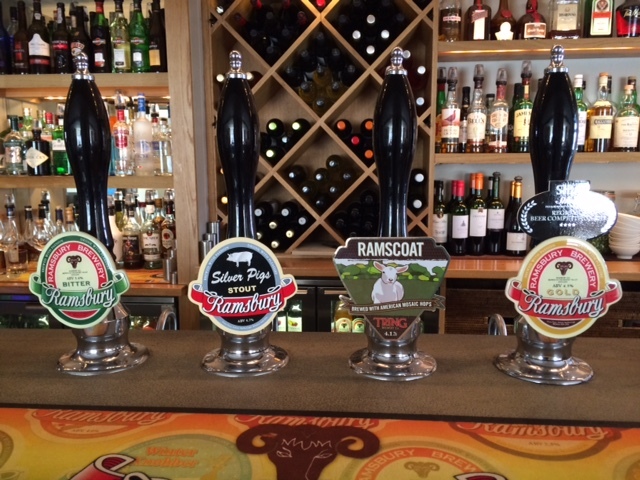 Unlike the US, most pubs in the UK are owned by breweries and feature the beers of the owner. They may offer guest beers as well. A pub not owned by a brewery is known as free house and is free to serve any beers they want. 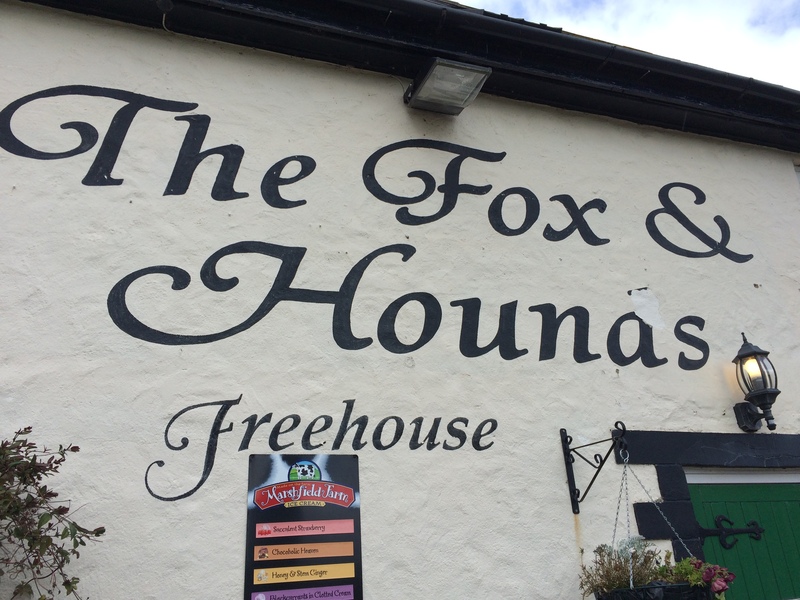 The Fox and Hounds Freehouse near Uffington. You generally don’t get table service in pubs. Claim your table and, if you want a meal, ask for a menu at the bar. Check to see if the tables are numbered. Once you’ve decided what you want to eat, order at the bar and give them your table number if there is one. Your drinks will be served at the bar and the food brought to your table. If you plan on ordering more, you can run a tab (if they accept credit cards). Bring some napkins with you. The Brits insist on getting a full pint, therefore your beer will be filled to overflowing with little or no head and the barkeep will not clean off your glass. And you’ll probably spill some on the way back to your table. adventurous beers – a dark, fruity ale, an English-style bitter and a chocolate porter. We found these in bottles in the local grocery stores in Dingle and on cask in a few pubs. Otherwise, Guinness is king in Ireland. Murphy’s and Beamish also make decent stouts. Smithwicks is more popular with Americans than the Irish, I think. Besides the red ale that is sold in the US, Smithwicks recently began producing a pale ale. We didn’t try it. Harp is also made in Ireland but I don’t remember seeing any on tap in Dingle. Hard cider is popular in both countries. Perry (pear cider) is found in a few pubs in England. The uninteresting Bulmers (known in the US as Magners) and Strongbow are the most popular draft ciders. Craft ciders or real ciders are worth seeking out. Look for cloudy cider or scrumpy. Dingle, in Ireland, also boasts its own distillery, whose products we saw all over. Dingle Distillery is currently selling vodka and gin. Their whiskey is aging in barrels and will be released in 2016. Yorkshire may the beer capital of England. The York branch of CAMRA takes a beer inventory every year. In 2014 it counted 281 real ales available in 164 pubs in and around York. Of those 281 real ales, 74 of them were brewed by 22 breweries located within 25 miles of York. See our own beer inventory below. Looking for cocktails? You’ll have to go to a cocktail bar for anything but the simplest cocktail. Order a gin and tonic in a pub and you’ll get a glass with ice and a shot of gin and a small bottle of tonic. Order a Bloody Mary and you’ll get a glass of ice with a shot of vodka, a bottle of tomato juice and they’ll hand you Worcestershire sauce and Tabasco to add to your own taste. None of the creative seasonings or garnishes that we have in the US. Most pubs stock at least a couple of white wines, a couple of reds, and maybe a rosé and a sparkling. There are wine bars in the larger cities. Here is a list (and some photos) of the pubs we visited in England and Ireland, and some of the beers we enjoyed. We forgot to write down a few :-).